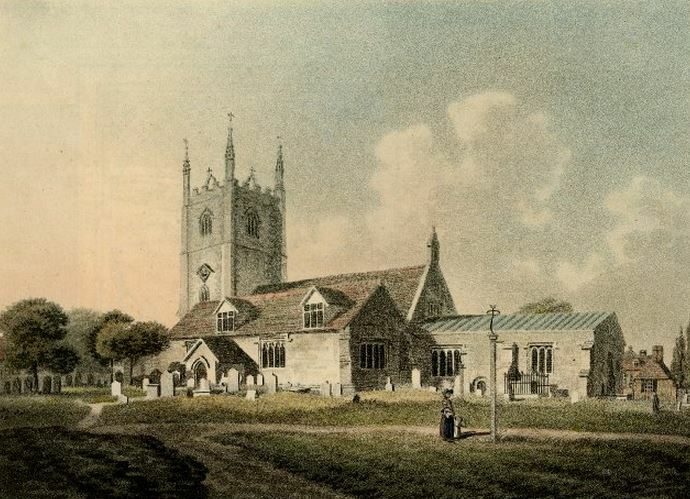 Horace Man was born in 1782 at Reading, Berkshire, the youngest child of John and Sarah (Baker) Man, and was baptized on 29 June 1782 at St. Mary the Virgin, Reading. He died in September 1817 while living on Castle Street, Reading, and was buried on 7 September 1817 at St Mary the Virgin. He was the victim of drowning (see below). His was unmarried. Horace is a member of Man Generation Seven. Notes extracted from the Berkshire Archaeological Journal, vol 66 (1971-2), p. 121 et seq: T A B Corley: The Earliest Reading Bank: Marsh, Deane & Co. The bank lost money almost from its foundation in 1788 through the incompetence and greed of its directors and their relations. The partners ‘seldom inspected the books kept by its Chief Clerk Horace Man’. In December 1814 one of the partners’ sons lent the bank’s money without authority; Horace ‘severely reprimanded him’. 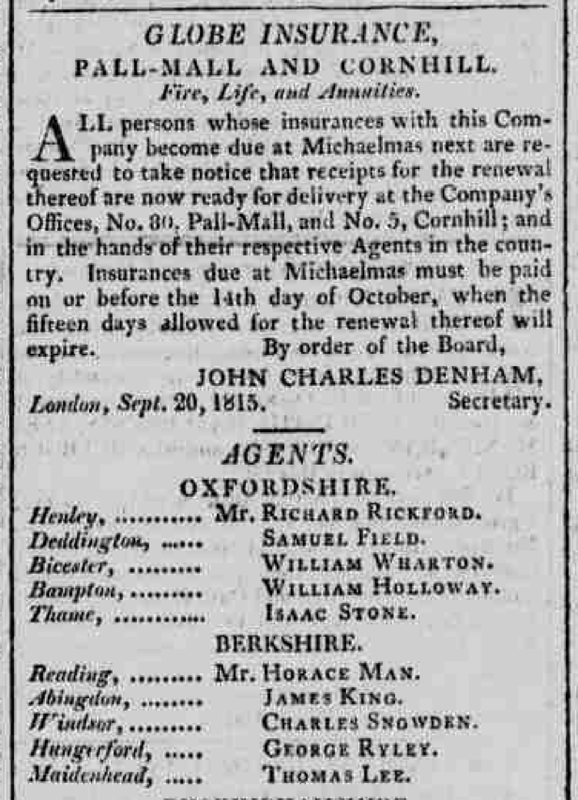 Matters came to a head on 5 January 1815 when Horace closed the bank’s doors and stopped further transactions. ‘It is agreeable to note that the very last payment, actually made in the back parlour, occurred when the surgeon John Hooper called a little later to cash some drafts. Man refused them, but was persuaded to pay – with notes on Stephens’ bank – one for £175 belonging to a widow with a large family, who would otherwise have been destitute’. Note: This reference to Horace was uncovered by Sidney Gold and passed along by Reading historian Adam Sowan. Comment: From these brief glimpses Horace emerges as a man of integrity and compassion. Melancholy Accident – Tueday last, Mr Horace Man, of this town, left Caversham Pound, about half past twelve in the morning, in company with two friends, in a pleasure boat, with the intention of sailing up the river to Pangbourn and there dine, they had proceeded about a quarter of a mile beyond Hardwicke, the wind blowing directly behind them very strong and in an exposed reach, one of the gentlemen was at the helm, the other at the head, and Mr H. Man sitting at the right side, about the middle of the boat; on the left side of the river near some weeds, the boat met with an obstruction under the water, which caused a small shock, Mr. Man immediately jumped up in some alarm, as if for the purpose of ascertaining the cause, at this instant the boat bore away to the right, and the wind being very strong the sail suddenly swung round and the boom struck Mr. Man so violently, that he fell over – one of the oars falling over at the same time, the sails being set and the wind being directly at the stern, it was impossible immediately to stop the boat, and before she could be brought around to the spot, Mr. Man had sunk to rise no more. An alarm being given, assistance was immediately rendered by the work people, and in about half an hour the body was found, and three Medical Gentlemen being in attendance from Pangbourn, tried every experiment to restore animation, but we deeply lament to say without effect. The Coroner’s Jury returned a verdict of Accidental Death. Comment: From these brief glimpses Horace emerges as a man of integrity and compassion.